Hartsfield-Jackson Atlanta International Airport (ATL) officials, along with City leaders and partnering construction and design firms, marked a milestone in the Airport’s capital improvement program, as steel installation is set to begin on the massive canopies that will change the face of the Domestic Terminal. On Oct. 1, the steel trusses that support the canopies will be moved from the staging area to the North roadway. Airport General Manager Roosevelt Council, Jr. said the “signature project” of the multibillion-dollar ATLNext program will draw attention near and far. “These canopies, iconic in their appearance and functionality, represent the exciting future of the world’s busiest and most efficient airport,” Council said. The design requires 3,500 tons of steel to support 19,776 square yards of ETFE, a translucent polymer, over the North and South entrances of the Domestic Terminal. In 2002, the Department of Aviation’s Planning and Development team proposed a canopy concept, with ATL officials implementing the current design plan in 2015. The joint venture of New South – McCarthy – Synergy began prepping the site in 2016. New South Construction CEO Doug Davidson said his team is excited to be part of such a monumental project for Atlanta. “The continuous growth and expansion of our Airport not only provides great careers for many people in our community, but also provides tremendous opportunity for many of our local and small minority-owned business partners,” Davidson said. 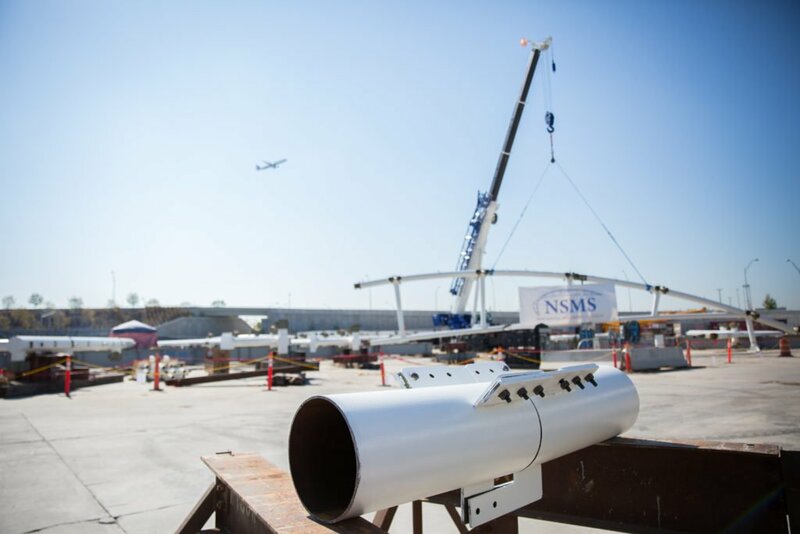 Still, there are inherent challenges with leading a large-scale construction project at an Airport with more than 270,000 people navigating through the facility each day. ATL’s Planning and Development team, led by interim Assistant General Manager Tom Nissalke, will mitigate traffic issues at each construction stage while placing top priority on public safety. “Aspects of this work will be performed 24 hours per day with the utmost attention being paid to safety,” Nissalke said. Reed said he expects the Airport’s transformation to further advance Atlanta’s position as a top business city. Add at least five extra minutes of travel time to the Airport. Obey speed limits while entering construction areas. Watch for signs redirecting traffic. Check this website for the most up-to-date information.